How are you all doing? It’s the month of festivities, Christmas is here and it’s time to decorate our houses and enjoy some family time! Our theme for this month is to ‘Deck up the halls’ and we would love to see how you would create stuff for decorating your homes. 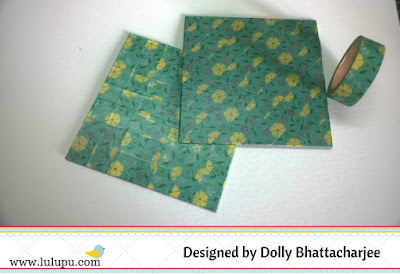 Remember, to use washi tape and mod podge to create your projects and win some awesome goodies from Lulupu! 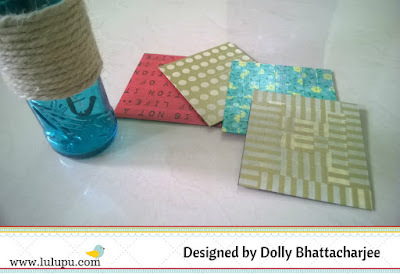 For my project this month, I was going crazy, since washi tape and mod podge is such a hit combination. There is so much you can do. I chose to make some easy coffee table coasters for inspiration. 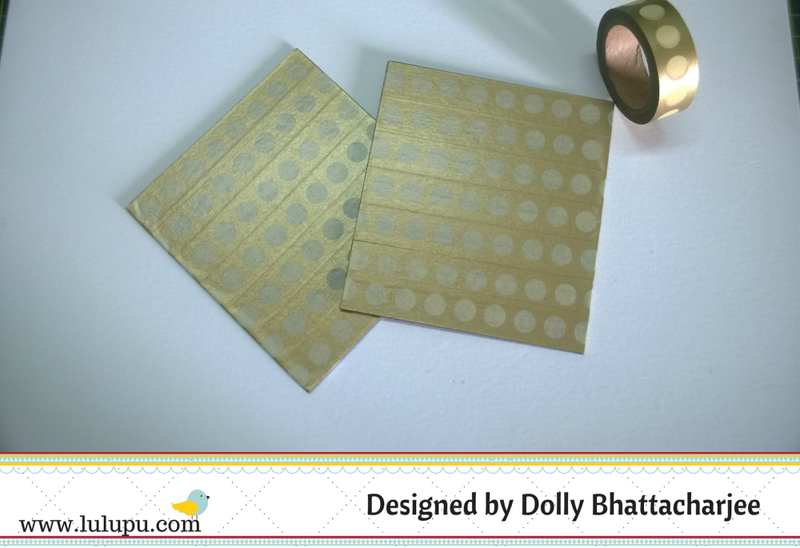 I have used different washi tapes and some pattern paper to make these coasters. 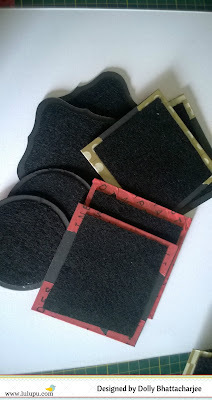 You would need some stiff cardstock (I wanted to try making these with tiles, but unfortunately, I couldn’t find them at the local store), some felt paper for the backing, washi tapes, and the all-time best– Mod Podge. Just follow the pictorial below and I am sure you will be itching to create some of your own. 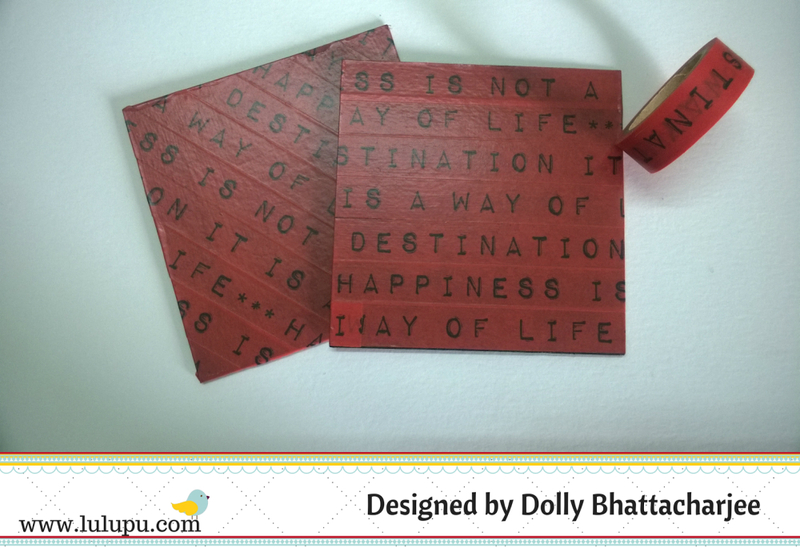 These are great as gifts to your family and friends too! 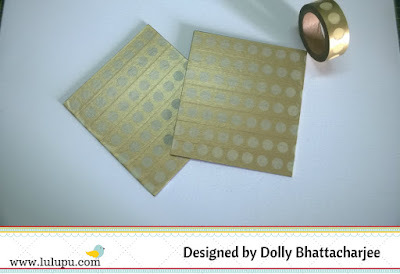 Use the washi tapes to cover the surface of the cardstock and add a thin coat of mod podge to seal them. 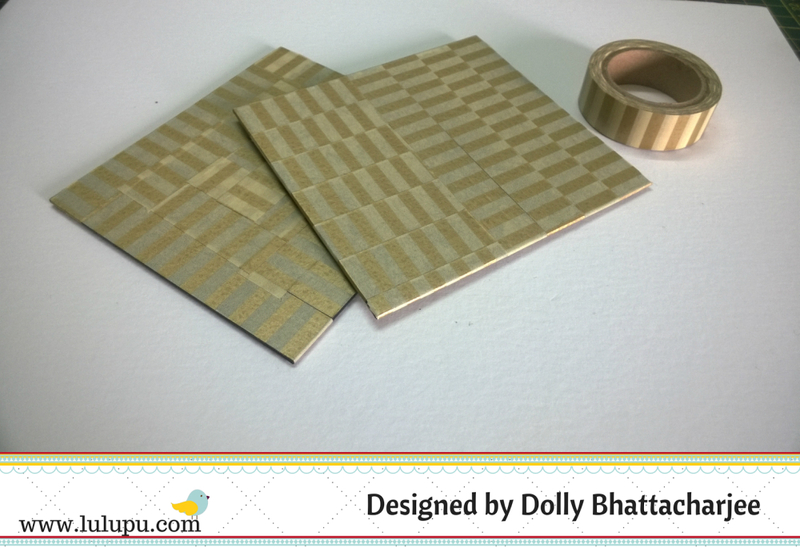 As you can see, I have tried different patterns with the same washi tapes. You can also try to mix and match with different combinations of washi tapes. The felt paper is added to the back side of the coasters to help it make anti- slip! I also tried using patterned paper for a couple of my coasters and I loved how they turned out. I followed the same process of adding the patterned paper on the cardstock followed by adding a coat of mod podge to give the final finish. 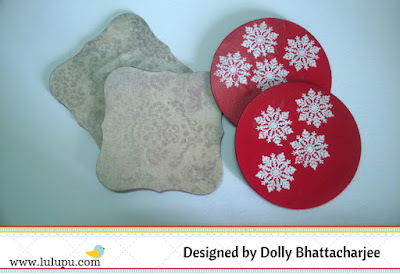 For this coaster, I wanted to make it Christmas themed, hence I used a red cardstock to cover the base and then heat embossed some snow flake. After letting it cool down for a few minutes, I added a thin coat of mod podge to coat the top. Doesn’t it look so cute! 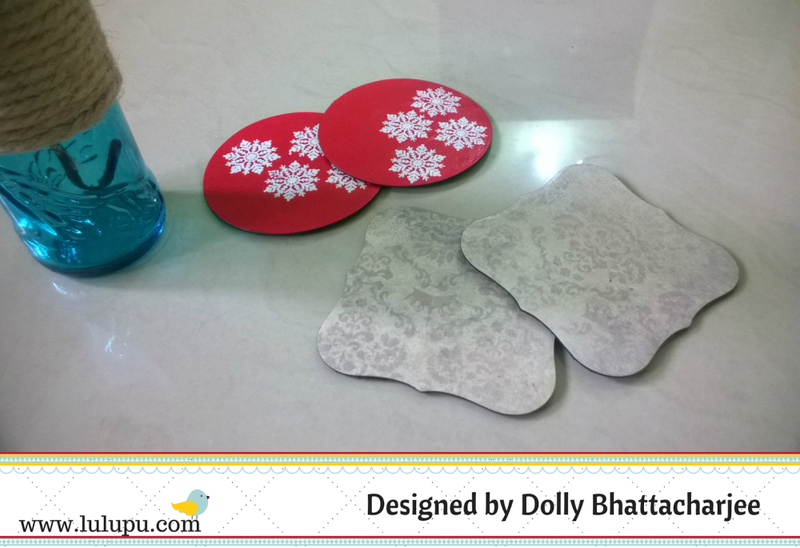 So, I hope you guys are already rushing to your craft room to make yourself and your friends some cute coasters! 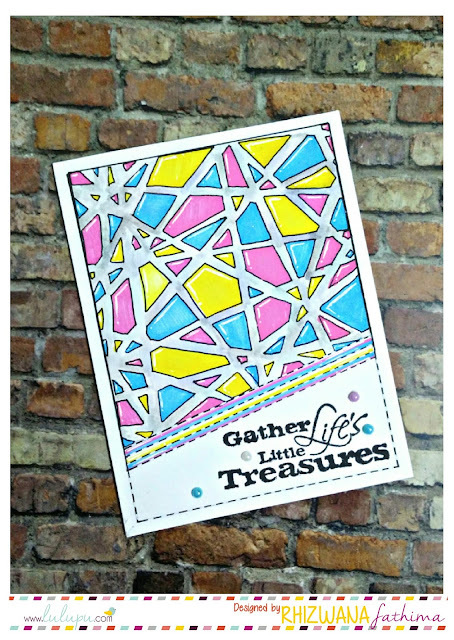 Don’t forget to link your projects for this month’s challenge! 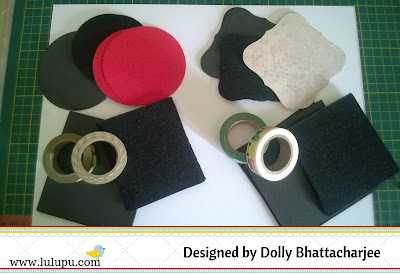 These must have been fun to make Dolly!